Disconnect Turbine Shafts (Always first)! Upgraded to version 2.2! New engine, huge impact on performance, durability, control and endurance. Part count dropped from 593 to 483! The full changelog doesn’t fit inside this container, it can be found here. Back in August 2016 this was my first turboshaft helicopter in almost a year. Very easy to fly! Version 2.0 is more than twice as fast as 1.2 and has three times the range. Some hints & tips can be found in the album. The new album can be found here. Increased part count from 568 to 593. Filled the tanks to 100% to increase range, it’s able to land on the island runway now. Improved the bearings, no more explosions and a little bit less drag. Added two extra Juno’s for forward motion. Improved aerodynamics and flight control. For taking off, flying around KSC and landing, use SAS. Otherwise it’s sufficient and even preferable to use trim. Reduced part count from 576 to 568. Improved bearing reliability. You still might see some explosions but usually they don’t have much effect. Improved paneling all around, especially the doors. Fixed the bugs with the sunscreen & doors action groups. Press Space for decoupling both turbine shafts. Power modes: press AG1 for 25% power, AG2 for 50%, AG3 for 75% and AG4 for 100% power. Abort shuts down all engines. Use AG5 for the Forward Motion Jets. 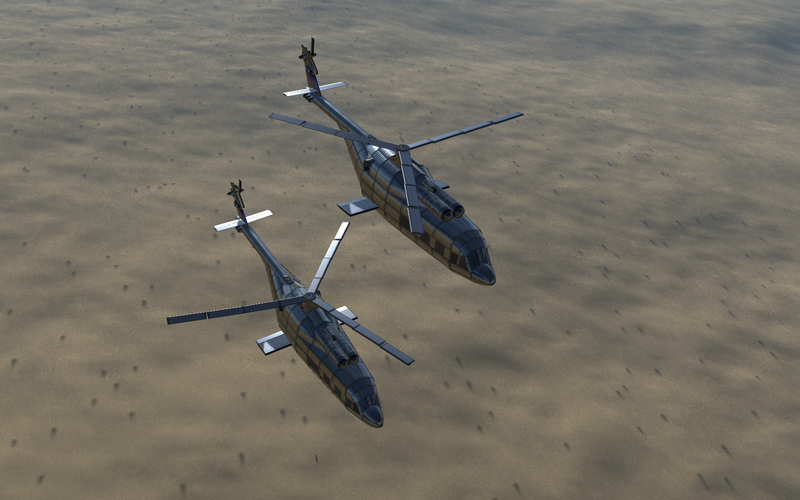 A stock turboshaft helicopter. Built with 483 of the finest parts, its root part is mk3CargoBayM.